Asclepias incarnata, commonly called swamp milkweed, is an erect, clump-forming, Missouri native plant which is commonly found in swamps, river bottomlands and wet meadows throughout the State. It typically grows 3-4' tall (less frequently to 5') on branching stems. Small, fragrant, pink to mauve flowers (1/4" wide), each with five reflexed petals and an elevated central crown, appear in tight clusters (umbels) at the stem ends in summer. Flowers are uncommonly white. Narrow, lance-shaped, taper-pointed leaves are 3-6" long. Stems exude a toxic milky sap when cut. Flowers are followed by attractive seed pods (to 4" long) which split open when ripe releasing silky-haired seeds easily carried by the wind. Flowers are very attractive to butterflies as a nectar source. 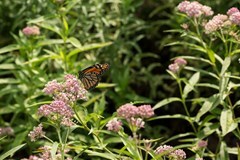 In addition, swamp milkweed is an important food source (albeit somewhat less important than upland species of Asclepias) for the larval stage of Monarch butterflies.